What Size Washer & Dryer Do I Need? Washers and dryers are generally measured by the size of their drums — the part that actually holds your clothes. When determining the right size for your household, consider the size and number of laundry loads you do each week. If you would like to do fewer loads, large appliances may be right for you. Washer and dryer sizes vary from manufacturer to manufacturer. Find the correct size washer and dryer for your houeshold. Large washing machines may hold up to 12 pounds of laundry per load and are best used in conjunction with a large dryer, which may have a drum with up to seven cubic feet of space. These are best for large families, according to Dimensions Guide.com. Medium-size washing machines generally hold approximately 10 pounds of laundry, while the drums of medium dryers measure approximately five cubic feet. These should fill the needs of a family of four. Compact washers can usually hold at least six pounds of laundry, and their compact dryer counterparts have drums measuring around three or four cubic feet. Families will run the washer more. According to National Geographic, the average person washes three loads of laundry per week, while the average family does eight to 10 loads. 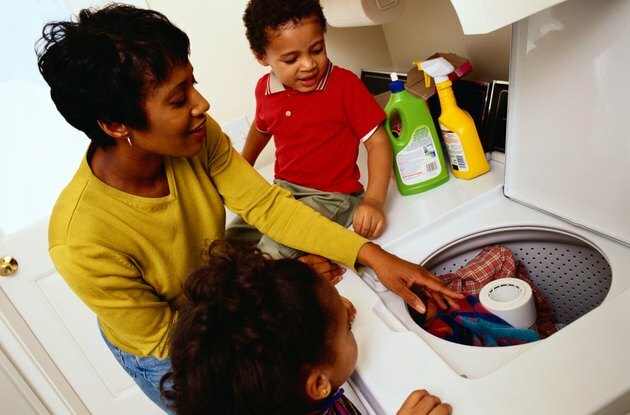 Purchasing a large washer and dryer generally reduces the number of loads your family needs to do each month. However, if your washer and dryer are too large for your needs, you may waste energy and water each time you use them. A large washer and dryer means less loads. Large washers and dryers may last longer than their smaller counterparts because they are used less frequently, which lessens their wear and tear. According to Alter Eagle Construction, a washer should last 13 years and a dryer 14 years with regular use. A professional writer since 1994, Eva Talent was trained as a journalist by the U.S. Army. She received two Army Commendation Medals and an Army Achievement Medal for journalistic excellence. Her press releases are frequently featured on the websites of the Department of Defense and the Army. Talent holds a Bachelor of Arts in psychology from the University of Michigan. What Is Best Top-Loading Washing Machine? How Wide Should Dresser Drawers Be?